The Case of the Missing Trampoline – He Said What?! I took a little detour after dropping Aaron off this morning to drive around our neighborhood circle. Actually, I had a purpose. I was looking for our grill cover. We had terrible winds yesterday and last night, strong even by Kansas standards. The winds must have whipped our grill cover right off and blown it who-knows-where, because it’s gone. It’s heavy and large, but it wasn’t too heavy for those strong winds. I never did see it this morning. Maybe it blew in the lake. Who knows? All of this reminded me of a funny story that happened when we were stationed at Fort Huachuca, Arizona. 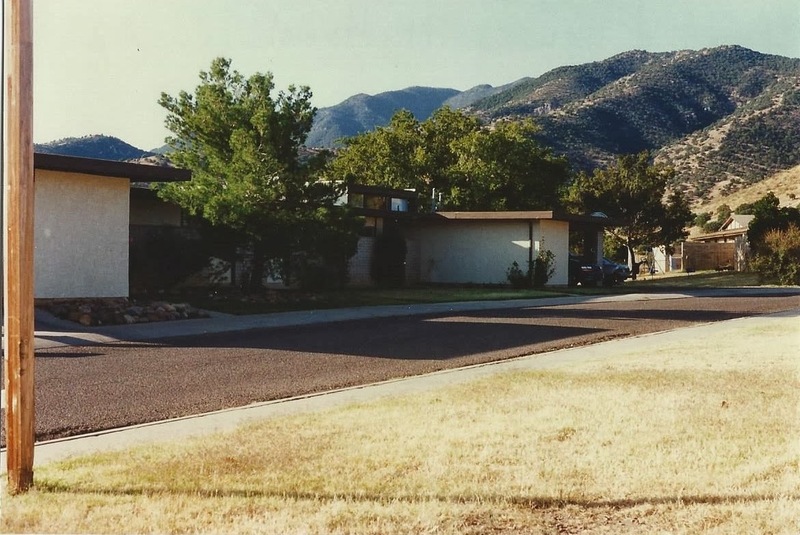 We lived in military quarters on post, in a really beautiful setting. 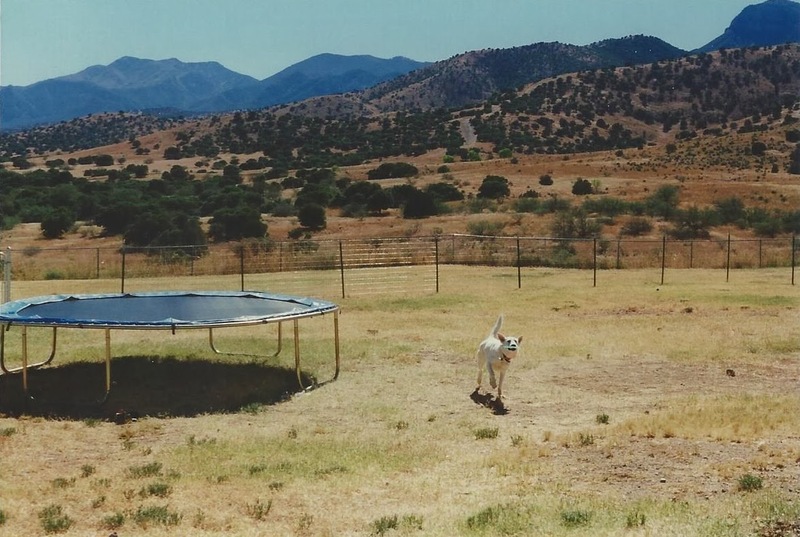 We were surrounded by the Huachuca Mountains and had a stunning view from our large back yard. We loved sitting on our little patio and soaking in the view, with gorgeous sunsets and brilliant storms. We bought a trampoline and put it in our fenced back yard. The kids spent countless hours out there with each other and with friends, jumping to their heart’s content. They even talked Gary and me into jumping on it. And none of us will ever forget the night we all camped out on the trampoline. OK, OK……..they all slept on it. I waited until everyone was fast asleep and snuck back in the house to our comfy bed! Because of the mountains, we got some very powerful winds there. One night we thought that surely the house would blow away. When it was daylight, one of the kids ran to me with the news that our trampoline was gone. “Gone?” I asked. “What do you mean, gone?” So I walked to the window to take a look and sure enough, no trampoline. The kids, the dog, and I all went outside to take a better look. Where was our trampoline? We looked some more, but still there was no sight of it. “A missing trampoline?” the man asked. So I explained that the night before, our trampoline was there as usual, but this morning it was gone. I just thought that maybe I should report it in case someone turned in a report of an unwanted trampoline in their yard……or on one of the flat roofs………or smashed against their car. Or could it have been stolen? Not likely, but what if? Could we have a trampoline thief on the loose? The MP on the line took my report and we hung up. Before long, our doorbell rang and when I opened the door, there stood a man. He told me that he was a military police investigator and was there in response to our report of a missing trampoline. There he stood, very serious, and wearing a trench coat. A trench coat. Really? “A statement?” I asked. “Yes ma’am,” he answered. “I need a statement about your missing trampoline.” Now I really did feel foolish, but he was so very officially stern and so I agreed. We sat at the kitchen table while he opened his briefcase and while the two MPs were looking around our back yard as if it was a real crime scene. The kids were taking this all in, thinking it was quite a fun adventure. I remember being very worried about Aaron, who saw “Policeymen,” as he called them, as being mean men…………so therefore he would say unkind things about them when we would pass one in the car. “Please, Aaron,” I silently begged. “Don’t say a word. Not one word about your opinion of this very young and very serious military police investigator.” And it hit me again…….an investigator for a trampoline? Really? This trench-coat clad investigator very solemnly wrote down every word that I said about the circumstances surrounding our missing trampoline. Every word. Written by hand, in duplicate. Now those of you who know me know that I find humor in most situations………and I was certainly beginning to find humor in this one. The kids were excited, and Aaron was being unpredictable, and the outside MPs were being unproductive in their search, and this very stern investigator was thoroughly writing down my every word…….and I was finding it all quite funny. That was it. I burst out laughing. I mean, I really thought that he was kidding me. He was not. His mouth did not move as he stared at me………which made it even funnier to me. I knew I needed to hush but not before I said, “You mean you’re serious? You really want me to raise my right hand and swear that what I’ve said is true?” He did. So up went my right hand as he asked me if I swore that what I said was true. And I swore that what I said was true, and I also swore inside that if he didn’t soon leave then I would be laughing loudly and being a bad example to my children. Where was Aaron anyway? Finally, the grim, young trench-coat-clad investigator left along with the two even younger MPs………who, by the way, had found no hide nor hair of our missing trampoline. I closed the door, and at last was able to laugh without being arrested. When Gary returned from the air field that evening, he and the kids went on their own trampoline search. It wasn’t long before Gary found some springs and some hooks on the ground. He followed their trail to the nearby hospital, where he found our trampoline wedged up against the back side of the building. For crying out loud! Gary didn’t even have on a trench coat and he was able to solve the crime! I thought that was funny. He didn’t. Oh well, the trampoline was found and was soon put back together. We should have invited the investigator over to see it for himself. Why didn’t I think of that? Previous Previous post: We Go AHEAD One Hour? Next Next post: What’s Wrong With Him?